“If you wish to ensure that white people will never speak to you about art again, there is an easy escape. Simply mention your favorite artist is Thomas Kinkade and that you are in negotiations to purchase an original from the store in the mall. This will effectively end any friendship you have with a white person.”I realized that when I bought not one, but two Thomas Kinkade repros from a mall, and showed them, happily to a white Christian artist friend. Who was horrified. You know I really, really do have good taste in art. Promise. And loathe kitsch. 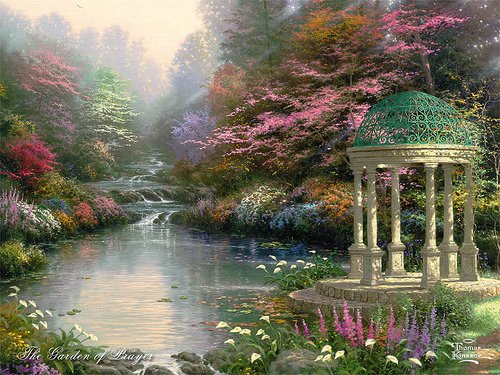 But Thomas Kinkade appeals to something in me. I love his paradisial landscapes. I love the way the seasons are all jumbled together. How trees and flowers from every continent appear. That’s what heaven will be like, I think. There is this sense of the jumbling of the “natural order,” deranging of nature in Scripture, when it talks of God’s blessing. Aaron’s staff, a sign of God’s power, had buds, blossoms and fruit all together. It’s been a symbol of me of the possibility of the sudden flowering of creativity, a sudden burst of inspiration. In another of my favourite passages, Ezekiel 47, we are told that the trees on the banks of the river which flows from the sanctuary bear fruit every month because the water from the sanctuary flows to them. 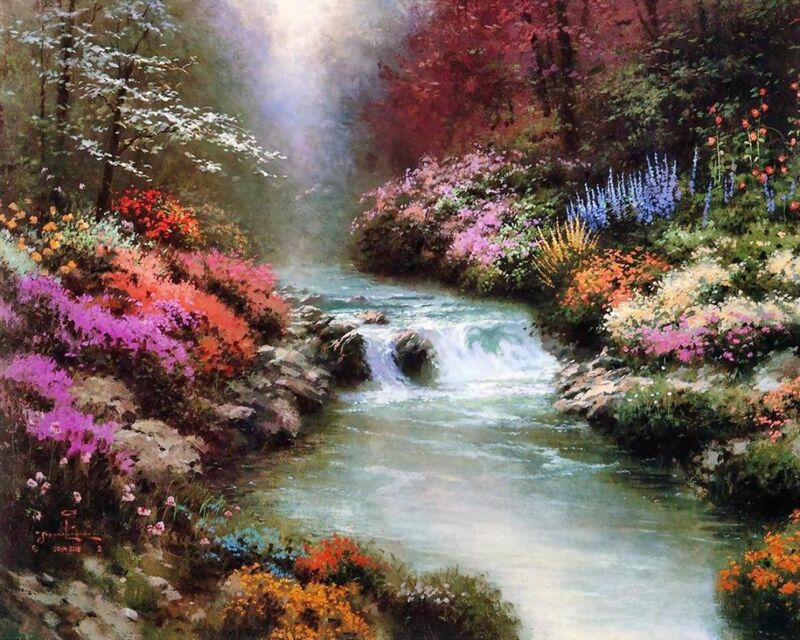 That’s what’s Kinkade’s landscapes remind me off, the beauty of all the seasons together; spring, summer, autumn, winter; and trees and flowers from every continent, blooming in an immense and joyful profusion–together. Quest for Joy-5: Michaelangelo and the Sistine Chapel. Thanks everyone. I agree LA. It does have a beauty all to itself. Pidge, I think it's beautiful in the way some impressionists and Pre-Raphaelites are beautiful. Pretty-pretty, yes, but lovely too. It conveys an ethereal, other-worldly world that I find beautiful!! Thomas Kincade painted the light, which is why I think they appeal to me. Also, while he was in love with his wife before he strayed, he painted her initials in each painting to show his love. I read one of his books about his marriage at twenty years. Encouraged me and made me a bit jealous. At thirty years of marriage, I'm in love all over again. So even though he failed, God has used him to strengthen me. Aaaaargh. You have an instinct for words and know when something is well written and no doubt cringe or laugh at the badly written. Believe me Kincade is more cringeworthy to those with an instinct for good art than even the bright green grass and beautiful people in happy family groups of J.W. L.D.S. and S.D.A. art. Now who is left that I haven't insulted… ? Ah, yes, the R. C.s can also turn out a good line in B.V.Ms with princess Di eyes and robes in a shade of blue that was never seen in 1st c. Nazareth. Funny, I have one too, and while it's not Rembrandt, it has a beauty all to itself. And I love the allegory to heaven…I will look at my Kincade with a renewed eye.